A summary is a concise account of the main points in a document. Some of the terms used to describe summaries in business writing are: ‘executive summary’, ‘overview’, ‘key points’, ‘issues’ or just ‘summary’. 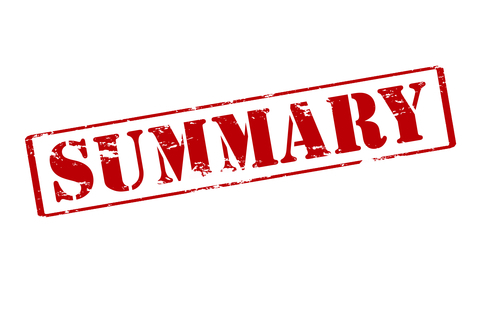 How you approach writing a summary depends on what type of document you are summarising. Some documents, such as board papers, have ‘short summaries’, and others, such as annual reports, have ‘long summaries’ (in comparison). Long summaries, often called ‘executive summaries’, vary in length, but are often a page or even longer. Short summaries, often called ‘key points’ or ‘overview’, are just a few paragraphs or bullet points. I am writing here about board papers, but a short summary could be used in other types of writing, such as memos or minor business cases. Short summaries are not stand-alone, because directors must read the rest of the paper. In a decision paper, the recommendation works in tandem with the summary, which means you don’t have to repeat the recommendation in the summary. Some people argue that a summary is not necessary in short documents, but I believe it’s useful because it provides a context and a quick overview of the topic. Directors can read the rest of the paper with a greater understanding of the issues. Imagine if you were asked to approve a project costing millions and instead of immediately being told ‘why’, you were given a detailed picture of what had happened in the past. You would probably work out why the project was necessary, but only after you’d waded through the background. Another argument against a summary is that it makes the paper repetitive. This is true, but a small amount of repetition is OK as long as the summary is not a copy-and-paste of material in the body of the paper. What information should go in a short summary? When directors are reading the rest of the paper, there should be no surprises. They know what they are reading about and why, and are looking for your reasoning and supporting evidence. There is never a right and wrong way to approaching writing – it is the end result that matters. Having said that, I suggest you write a draft summary first to crystallise your thinking, and lay the foundations for the rest of the paper. To do this, you must be very clear about what you are asking for or what you want to say. Now that sounds obvious, but when you are a subject-matter expert, it can be hard to see your topic from the directors’ point of view. They may not share your knowledge of the topic, and they are looking at the issue from a different perspective. A common complaint from directors is that they don’t understand what the writer is asking for or why they are receiving the paper. The best way I know of clarifying your thoughts is to just ask yourself questions: What? Why? How? If you find yourself going round in circles, find a friend or colleague and talk through your paper. Often saying things out loud helps us articulate our ideas – we use simpler words and explain things more thoroughly. Come back to your summary once you have finished the paper, and refine it. Given that the summary is only a few paragraphs or bullet points, each word must count. Is it clear in a decision paper what I am asking for and why? Is it clear why I have written this noting paper and what I want directors to understand? Have I alerted them to anything they should pay particular attention to? That the Board approve an increase in funds from $X to $Y for A Upgrade. The risks are X, which are being managed by Y. In alignment with our corporate social values, the Mangrove Rehabilitation Project aims to replace mangrove habitat affected by mining activity. Long summaries are often stand-alone. For example, in a substantive document, the summary may be written for a business audience who may not read the rest of the document. The summary may also be used in other contexts, such as a website or brochure. Recommendations and next steps may also be included in the summary. Take a look at how the recommendations are incorporated in the executive summary in this report, Strengthening the Asian Development Bank in 21st Century Asia. Because long summaries serve a different purpose, they require a different approach. You may jot down a few points as you are writing, but I suggest writing the summary at the end. Otherwise you could fall into the common traps of writing an introduction or background statement rather than a summary. Read your document right through. You could highlight or underline words or even copy and paste sections into your draft. Copied extracts will need rewriting to make them more concise. Once you are clear about your content, treat your summary as a stand-alone piece of writing. Start with what is most important for your readers and then structure your ideas so your writing flows well. When you have finished, ask yourself if your summary is a comprehensive overview of the document and check your language. Your report may be technical, but your summary is for a lay audience. Your language must be clear and simple. Question: Can you use acronyms in summaries? Answer: Let common sense rule. If you do use an acronym, the usual style rule applies – spell it out the first time you use it and put the acronym in brackets. Then use the acronym in the rest of the summary. In a long summary, I would spell out the acronym again in the body of the report, but there is no need to do this in a short summary. If you only use the term once in a long summary, ask yourself if you should use an acronym at all. Question: Can you use subheadings in summaries? Answer: Yes, subheadings are useful, especially in long summaries, to convey your messages. Keep them short and specific. Question: Can you use bullet points in summaries? Answer: A short summary may be entirely bullet points, especially in a noting paper. A decision paper and long summary will have a more narrative structure, but you can use bullet points to back up points. 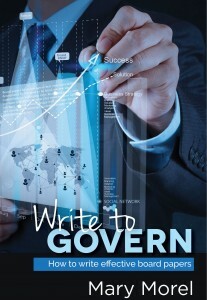 Writing a good summary is one of the most difficult, but important, aspects of business writing. It’s worth taking time to make your summary memorable. 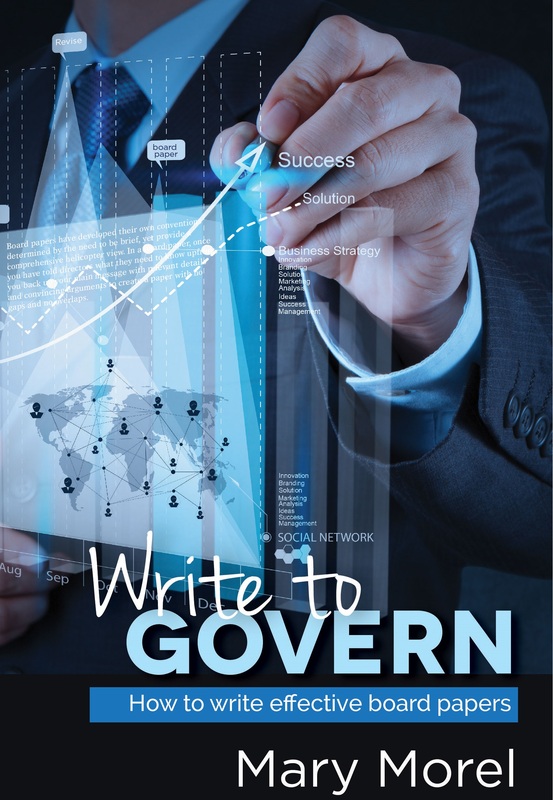 Learn more about writing board papers with my online course, Write to Govern. I also offer a two-hour seminar on writing recommendations and summaries. Contact me to find out more.